Teresa was near Zhongxiao Dunhua enjoying the good weather when I met her. 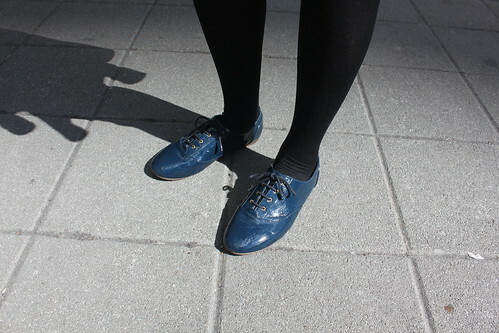 She is wearing a dark blue dress, black tights and blue brogues. As complements, just a silver bracelet and a silver watch. I think her outfit could seem simple, but is very comfy and elegant at the same time. Great outfit! I've never been to Taiwan but I definitely want to visit (especially since my husband is from there). Great blog! Can't wait to see more outfit posts! I love this! I've never been to Taiwan but I should be going soon! 😀 Ppl there have such great style. I love her shoes! Hi Rainy Days and Lattes! I like the simplicity of the outfit, and that everything is blue even her brogues!